5 5 East Pallant is a large Holiday House Ideal for Celebrations in Sussex. The holiday property is ideal for Groups of Families and Friends. 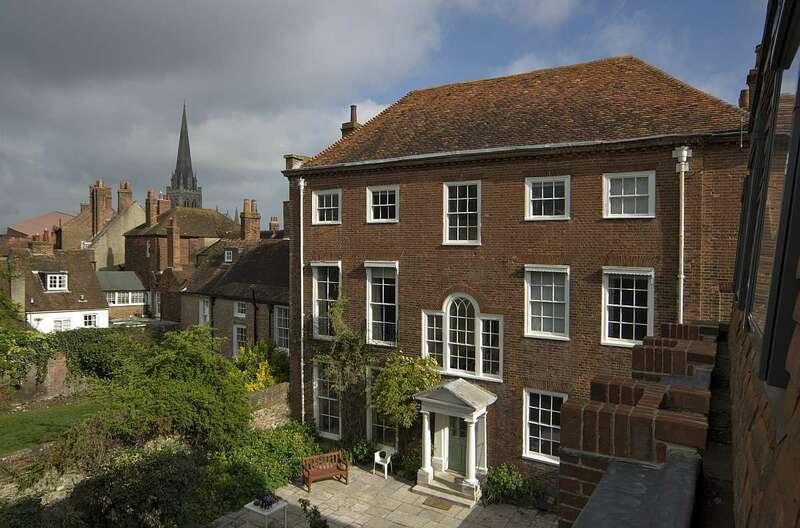 East Pallant House is located in the heart of Chichester with accommodation for up to 18 people*. Shops, bars and restaurants are all within a 3 minute walk. It is an ideal venue for a wedding party, anniversaries, birthdays, or works well for just a weekend retreat. It is also a perfect base for a trips to Goodwood or a weekend sailing. The House itself is a wonderfully large, symmetrical Georgian build with street frontage, parking, patio, and large garden. Split over 3 floors, this idyllic old house has been kept in a loving condition. Consists of a large entrance hallway with dining room, music lounge, sitting room and kitchen. The kitchen has two electric ovens, a dishwasher, a large american style fridge freezer, two sinks, and a washing machine. There is also a downstairs toilet. The back door leads directly on to the patio/garden area and the front door on to East Pallant, right opposite the Pallant House Gallery. Second sitting room with Sky T.V, Wii and DVD Player overlooking the garden. Study with desk and chairs, pool table and Wi-Fi access. Single Bedroom overlooking the front of the house. King/twin Bedroom over looking the front of the house with en-suite shower room. Second King/Twin Bedroom overlooking the garden. House bathroom with roll-top bath, wash hand basin and WC. A large bedroom overlooking the garden with 3 single beds or a king with single bed. There are three more King/Twin bedrooms, two of which are ensuite. One double Bedroom (with 4ft 6 bed) overlooking the front of the house and there is a family bathroom with bath, separate shower cubicle, wash hand basin and w.c.
Patio area with table & chairs and a BBQ leading to grassed area. There is a pathway at the side of the garden which leads to the parking area at the rear of the garden, the parking area is shared with the flats to the side of the house. Residents will use the path to get to and from the building but the garden is for sole use of guests staying at East Pallant .There is parking for a maximum of 4 cars. Please note the entrance to the garden is not gated and therefore children will need supervision. 5 East Pallant is ideal for a weekend retreat with extended family, or a business conference / entertaining long weekend. Whether you’re coming down for the attractions of Goodwood Races, Goodwood Circuit, Chichester Cathedral or just to explore the charming streets of the City alone, the house is definitely well equipped to ensure your endeavours are ones to remember. There is a Mark and Spencers Food store within a 3 minutes walk and the restaurant at The Pallant Gallery is excellent.